Want a cool headphone cover you can make? If you’re looking for a cool DIY project that only takes a couple of minutes, then this is the one for you. Make your headphone unique by adding some color and a little personality to it. Have you ever pulled your headphones out of your pocket or purse only to find them in a tangled mess? 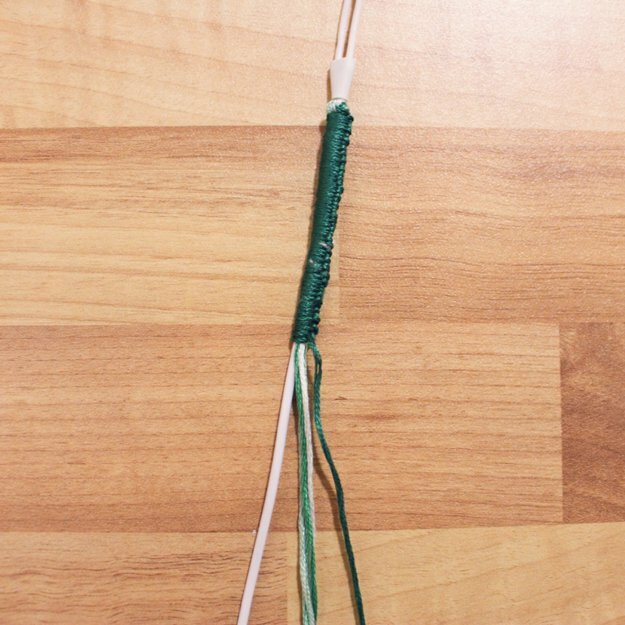 This easy DIY project will keep your headphone cord neat and make them totally unique! Cut your embroidery floss to 2.5 – 3 times the length of your headphone cord. Gather the ends and tie them around the base of the cord (just beneath the place where the cord splits in two). Be sure to leave a bit of a tail. Separate your first color and knot it around the cord, the other strands, and the tail from the large knot. As you pull it tight, slide it up to the base of the large knot. Continue knotting until you want to change colors (you’ll notice a ‘ridge’ beginning to form – this can twist or you can force it to stay straight by directing your knots in the same way. It’s totally up to you!). Change colors, allowing the remaining strand from your first color to blend in with the rest. When you near the end with your last color, take the remaining strands and tie them at a knot around the base of the cord, leaving out the strand you are knotting with. Continue knotting with this strand, covering the tail of the end knot until you reach the base. Tie off the end of your last strand and trim. Tip: To help keep your headphones stable and stationary while knotting, secure them under something heavy or tape them to your table. I stuck mine under my laptop and watched a video while I was knotting – it worked like a charm! This method can be used to cover all sorts of electronic cords – from phone chargers to USB cables, let you creativity flow!